Since we were dropping our BMW off just south of the Frankfurt airport, with the folks that would be shipping it to States, we decided to take the opportunity to visit the Frankfurt am Main Christkindlmarkt. The Frankfurt Christmas market is one of the biggest in Germany and draws just about the largest attendance of visitors of any Christmas market in the country. So, this is our last Christmas market of the season and of our stay here in Germany. It was a Thursday afternoon so the crowds were quite manageable which made the day there much more enjoyable. Here's some of the images of our last Christmas market of 2012. We've just dropped off the BMW and now we're driving into the big city. Frankfurt is one of the few cities in Europe that includes skyscrapers in its skyline. Here, we're crossing over the Main River. We've checked into our favorite hotel in Frankfurt, the Fleming's Deluxe. We've blogged about this before and some of the unique characteristics of this hotel. Here's one of those unique characteristics, the glass shower in the center of the room. I took this picture of Jeff from our bed. Yeah, that's a bit different. You can see the city skyline and traffic reflected in the glass walls of the building next to our hotel. The first time we visited the Frankfurt Christmas market was in 1988. We thought it was big then and it was quite crowded. Well, here we are on the periphery of the city's Christmas market which has grown north from the Römerberg (Roman Platz) all the way the main shopping district on the Zeil. Here's a cute barrel shaped warm drink vendor. Interestingly, they don't sell Glüwein. Say what!?!? Another chocolate vendor but here the chocolates are in the shape of tools and other common, every day items. Here you can see chocolate cameras and those light gray items are chocolate handcuffs. Here we're on Paulsplatz, just across the street from Römerberg. Pretty vendor huts. These paper star decorations are very popular at German Christmas markets. You don't see this often. Hand frosting their ginger bread cookies. Obligatory merry-go-round in the Paulsplatz. In the background is Wagner Honighaus (honey house). They build that house just for the Christmas market. Obviously, they sell all sorts of honey products including bee's wax candles and that sort of thing. Here we're crossing the street from the Paulsplatz into the Römerberg, the main square of Frankfurt's old town. Once we're into the Römerberg we're immediately confronted by Jeff's krytonite, the dreaded Kräuterbonbons. These vendors are at every German festival. These are strong liquorice or anise flavored candies and Jeff finds the smell quite repugnant. This area was almost completely destroyed during the war. These six buildings were reconstructed from 1981-1984 and make a magnificent back ground for the Frankfurt Christmas market. Prune people with walnut heads. Just what everyone wants for Christmas. Not just any merry-go-round in the Römerberg. This pretty one is a double-decker. Incredibly colorful Christmas market in Frankfurt with the beautiful rebuilt half-timbered buildings. The Frankfurt Christmas market has expanded all the way south to the Main River. What says Christmas more in Germany than the Mexikanisch (Mexican) vendor. Tacos anyone? As always, the sausage vendor is a popular place at any German festival market. Again, what would put you in the Christmas spirit more than Hot Africa's Christmas Circus? Never too cold for a bit of the amber nectar. We stopped at this vendor for a Carolus Doppelbock der Stark, a Belgium dark beer. They brought their Christmas tree all the way from Bavaria. Another pretty view of the Frankfurt Christmas market in the old town Römerberg. It's evening and we're walking back to the hotel. Almost forgot, gotta get a Glüwein. It's the last one of the season. As always, tasty and warm. Just north of the Zeil, Frankfurt's main shopping district, is our hotel, the Fleming's Deluxe. That's it with the yellow light top floor just across the street from the Eschenheimer Turm, one of Frankfurt's medieval city gates. Well, that's it. Our German Christmas market season is over. We hit some big city markets and a couple of small ones this year but they all shared one thing in common, fun and Glüwein. We're flying out of the country for Christmas. More on that when we return. Merry Christmas and Happy New Years!! We visited Freinsheim for their winefest back in April of this year. We had great fun that day and have been looking forward to their Christmas market ever since. The Freinsheim Christmas market runs through the entire Advent season but is only open on Saturday and Sunday during that period. Freinsheim is just north of Bad Durkheim, a bit east of the Deutsche Weinstraße (German Wine Road). It's one of the many Rhineland-Pfalz vintner towns in this part of Germany. So, this was our final stop last weekend after visiting Karlsruhe and the Sinsheim Auto & Technik Museum. Today Freinsheim is a town of about 5000 people and has a long history dating back to medieval times. These are the family crests on one of the hotels in the city center. You can see here they date back to 1588. Pretty half-timbered house on our walk into the town center of Freinsheim. Pleasant tunneld passageway in Freinsheim. A wonderfully ornate sign for a tobacco store in Freinsheim. Even advertises in iron that they sell lottery tickets, LOTTO. More well maintained medieval buildings near the town center. Christmas tree and church steeple in the Freinsheim town square. Freinsheim children singing a familiar Christmas carol. Even though they're little, the kids sang most of it in English which we got a bit of at the beginning of this video. Christmas market vendors along a quaint street in Freinsheim leading to the cities medieval gate and wall. A really cute little house up the steps from the city's walled tower. More Christmas market vendor with the town wall just beyond. The Freinsheim wall dates back to 1514. The Freinsheim tower looking back into the town. The town gate through their 1514 wall. Kind of a strange keystone over the archway of one of the town's homes; a Asian man with a big Brezel (pretzel) on his shoulders. One of the side streets in Freinsheim with a few vendors. Oh, and there's the required kids ride in the back. Yup, gotta get a Glüwein. Oh yeah, if you want a little something in your Glüwein, they can help you out. Pimp your Glüwein. That's the end of our adventures last weekend. Because we move back to the States next month we realize that we need to start an acclimation program. So, Sunday we pretty much laid around and watched the Vikings stomp on the Rams. Although we did have some good German beer during the game we probably should have had some Coors Light or Rolling Rock. Well, you gotta be careful not to take this acclimation stuff to extremes. After our Friday day and evening in Karlsruhe we made the short half hour drive to Sinsheim. Our reason for visiting Sinsheim is their Auto & Technik (Techinical) Museum. Sinsheim is in the German state of Baden-Wurttenberg, part of the Rhine Neckar region, just a half hour southeast of Heidelberg. We've driven by Sinsheim and the museum on the A-6 at least fifty times on our way to or from Munich. In the past we were always in a hurry to get to where we were going and looked at the museum from the autobahn with a bit of passing curiosity However, since we had been in Karlsruhe the day prior and so close we decided it was time to visit the Sinsheim Auto & Technik Museum and we're certainly glad we did! This is our normal view of the Sinsheim Museum as we pass by on the way to Munich. The Sinsheim Auto & Technik Museum opened in 1981 and is owned by a private association that also owns the Technik Museum in Speyer. Over a million people visit the museum each year. The highlights of the museum are the Air France Concorde and the Russian Tupolev 144, making Sinsheim the only museum in the world that displays both supersonic aircraft. 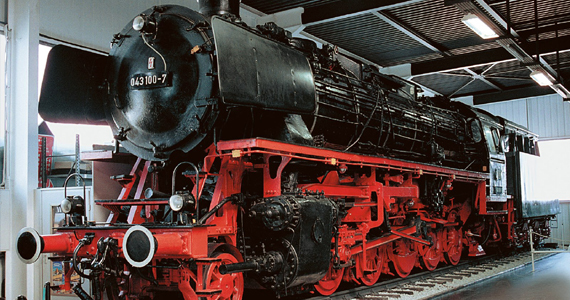 Sinsheim Auto & Technik Museum is the largest privately owned museum in Europe. Here you can see one of their static airliner displays with slides for kids. Sinsheim has really made the entire museum family and kid friendly. Lots of pristine displays at the museum including the Fokker Trimotor here in the middle. A colorfully painted Russian Su-17 Fitter. Behind in the blue building is the museum's 3D movie theater that shows various films throughout the day. If you want to see the flying film it's shown at 1500 (3PM) and 1800 (6PM) each day. When I say each day, I mean it. The museum is opened 365 days a year. The museum's Tupolev 144 which was first put on display in 2001. It is completely accessible by visitors to the museum who can enter at the back of the aircraft and walk all the way up to the cockpit. The Concorde was donated by Air France in 2003 and can be entered just like the Tupolev 144. Inside the museum films is show how both aircraft were delivered to the museum; a pretty amazing story in its self. The Sinsheim Auto & Technik Museum is not some cheesy car or plane museum. Every display is in top-notch condition and there's so much to see. Every car on display is pristine. A 1958 Cadillac Eldorado. Very nice. The bumper of the same Cadillac Eldorado. 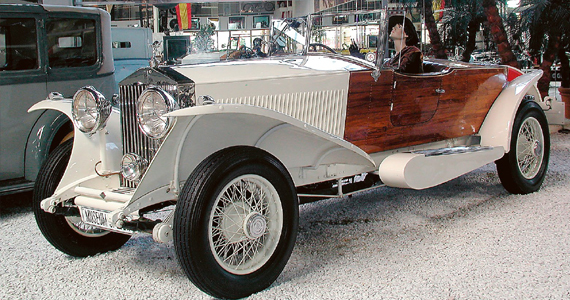 Only about 900 of these cars were made because they were so expensive to build. GM lost $10,000 on every car it sold. A beautiful, wood paneled Rolls Royce. Strange color, crystal hood ornament and rear view mirrors on top of the spare tires. Not just old cars either. Relatively new Ferraris, Porsches, Maybachs and pretty much everything imaginable. The Blue Flame powered by natural gas. Not sure about that record though, it says 1001,452 km/h. Now does that mean 1,001,452 km/h or 1,452 km/h? Either way the Blue Flame record was just over 630 mph. There's everything here. Planes, cars, tanks, locomotives, artillery, musical organs, motorcycles and every one of them is in perfect condition. Well, this Stuka isn't quite perfect. This is a early WW II German Stuka dive bomber that was found after the war and donated to the museum. An F-104 Starfighter that the German Luftwaffee flew from the 60's and into the 90's. This is the Sinsheim Museum Be a Jet Pilot display. For a couple Euros you get all the jet fighter sounds and are able to bank and climb and dive this aircraft. My favorite part of the museum. I love trains!! Look at me, I'm the engineer!! An interesting four seat motorcycle. An 1899 steam driven car. The Sinsheim museum was educational, fun and simply awesome. 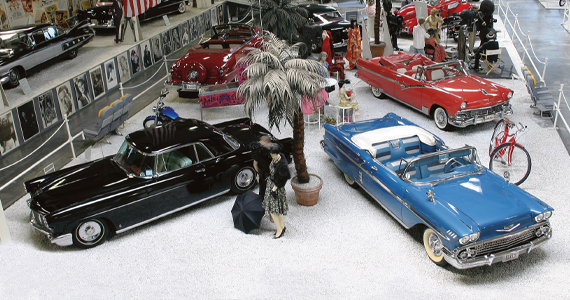 Here's a video that shows just a small part of the wonderful sights and sounds that you can experience at the Sinsheim Auto & Technik Museum. Did I mention that there's all kinds of musical organs in the museum. Here's one that was extra special. Do you recognize the song? * Take special note of the paper feeding into the organ and the picture of the guy building these music sheets. Now we're on the roof of the museum about to go into the Concorde. It's a steep walk up to the cockpit. Most of the seats are still in place but cover by a plastic wall. Glad they put this sign in English as well as Russian or we may not have found our way out of the Tupolev. The Sinsheim Auto & Technik Museum was wonderful; perfect for kids, big and small, young and old. They have everything you need for a great day out; restaurants, playgrounds, 3D movies and even a hotel if you want to make it a two-day adventure. We're so happy we finally stopped by the museum in Sinsheim after passing it by for the past twenty-five years.